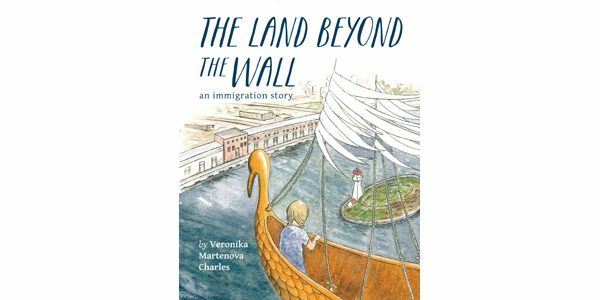 Given the abundance of stories about refugees and immigration released over the last couple of years, it might seem that Toronto author-illustrator Veronika Martenova Charles’s latest picture book is simply another among the throng. But The Land Beyond the Wall is something different: a very personal, fairy-tale tinged story based in part on the author’s own experience of coming to Canada as a teen. Charles was born and raised in Prague under communist rule. Though her parents allowed her to take art classes, her mercurial grandmother put a stop to the lessons upon discovering Charles was sketching nudes. Charles rebelled by forming a pop group that performed western music, eventually earning a fair amount of fame and the ability to travel outside of the Iron Curtain. On a stopover in Gander, Newfoundland, en route home to Europe after a tour in Cuba, Charles made the fateful and impetuous decision to defect. She was 19 and alone, with nothing to her name but a shark’s tooth, an English dictionary, a comb, $10 (which was later stolen), and the sundress she was wearing. She spent months in detention at Halifax’s Pier 21 during its last gasp as an immigration hub, where she taught herself English with the help of her dictionary and novels she acquired, and dreamed of what she would do in her new country. The artistic dreams of her younger years became reality when she studied illustration at Ryerson University and OCAD University (then the Ontario College of Art), and published her first book, The Crane Girl, in 1992. That volume went on to be a Bank Street book and finalist for the Amelia Frances Howard-Gibbon Illustrator’s Award. Treated like a burden and missing her parents, Lily’s only joy comes from her dreams of one day being an artist. Even these are dashed when Aunt Lily catches her sketching and tells her to do something useful instead. The parallels between Emma and Charles are blatant, but the author takes her story into the realm of magic realism when, lonely and sad, Lily discovers her mother’s old doll in the attic and is amazed when the toy responds when she speaks to it. Then a strange boat appears in the harbour and Emma (talking doll tucked safely in her pocket) decides to leave her home forever for a chance at a better life on the other side of the ocean. These types of autobiographical stories for young readers serve a dual purpose: on the one hand they let children know that they are not alone, not the only ones who have come through hardship and awfulness. On the other, they offer inspiration, a message directly from the author that says, “I did it. You can, too.” That Charles relates her personal fairy tale with such delicacy and style is a bonus.